Kudos to Scott Price of Sports Illustrated for his superb pair of pieces here at The MMQB on two broken former Dolphins: linebacker Nick Buoniconti, 76, on Tuesday and running back Jim Kiick, 70, on Wednesday. Price’s stories are thought-provoking and lead the reader to think there will be scores of retired football players from past eras in a gruesome line following Buoniconti and Kiick. Imagine if a player in 2017 said that. There’d be a Congressional investigation—quite literally. But that doesn’t mean it’s going to be any easier to hear the stories about the retired, broken players for the next 10, 15, 20 years. It’s a disgrace of the highest degree. And if thousands and thousands of parents across the country forbid their children from playing tackle football because of that, the NFL should blame no one but the stewards of the game at all levels of past generations. And the current stewards need to be tireless in their efforts to be absolutely sure that football—at all levels—now be played much safer than it was when Buoniconti and Kiick played. 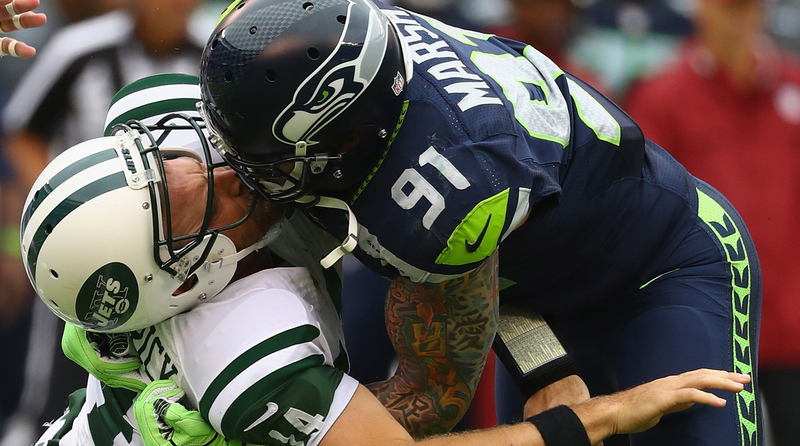 The NFL has made strides on improving player safety in recent seasons, but it will never be able to take the violence completely out of the sport. I don’t think football’s in danger of dying at the grassroots level. If you think it is, go to Texas or Florida or Georgia or Louisiana or Ohio on a Friday night. There will be players for Nick Saban—and his successor, and the successor to the successor—to recruit, players who will desperately want to get to the NFL. But I do think TV ratings might start leaking, with some thinking and feeling fans who can’t support the game anymore after reading about an endless succession of Jim Kiicks. We’ll see. But my advice for the NFL and commissioner Roger Goodell, who are spending millions and sincerely trying to make a nearly terminally unsafe game as safe as they can make it: Spend more. Do more. Both Jay Cutler and Tony Romo walked away from the NFL—and into the television booth—after good but perhaps unfulfilled careers. When talking about Cutler, you say: “Eleven seasons, one playoff victory. He had some great moments, and too often we think quarterbacks can lift teams by themselves. But they can’t. However, one playoff win is one playoff win. I expected more out of Cutler when I first saw him play in Denver a decade ago.” I think the only reason Jay Cutler gets more grief than Tony Romo is because Tony was way more likeable as a player. If you look at their career stats, Romo played an extra 17 games. He has 10 more wins, 1,700 more yards, 40 more TDs and 29 fewer interceptions. One could arguably say that Romo was only a SLIGHTLY BETTER quarterback, given the stats; and Cutler was 1-1 in the playoffs while Romo was 2-4. And I would argue that Romo had way more talent around him than Cutler had. But when they are spoken about in the media, Romo is hailed as a terrific QB and Cutler is hailed as a disappointment. • Cutler was the 11th player picked in the 2006 draft. In 2003, there were 16 quarterbacks invited to the combine, and Romo was not. (Though he did go as a combine “arm,” to throw to wide receivers on the day of their workouts.) There were 13 quarterbacks drafted, and Romo was not. Romo lived on the edge of a roster for two years and never threw an NFL pass until well into his third year. Cutler was handed the starting job in Denver midway through his rookie year. To whom much is given, much is expected; and vice versa. 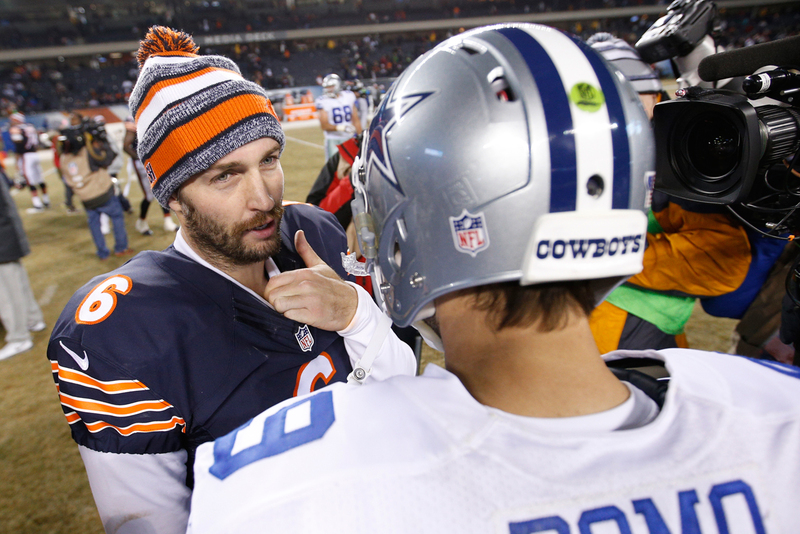 Cutler was supposed to be a top quarterback; Romo was never supposed to make it. • Romo’s career completion percentage: 65.3. Cutler: 61.9. Romo’s passer rating: 97.1. Cutler’s: 85.7. So Romo in my mind not only was a significantly better quarterback, but also came from way behind Cutler to be better. I still can't believe Jay Cutler is going to be broadcasting games. You called him “Negative Nate?” Congrats, it's only May and you won understatement of the year. He is the human version of Grumpy Cat. You might be right, and I have my doubts too. But I will say that there’s something about a guy who isn’t a back-slapper and the coolest guy in the room … and that something is that he might not be so inclined to protect every player as so many analysts do. If he’s grumpy and honest, I’ll take that. I read your part on the Jed York-Jim Harbaugh situation, and all I could think about is talk is cheap. It'd be interesting to know whether he actually reaches out to Jim Harbaugh or if he's just going to talk about it. Good question. That’ll be a question I’ll ask York in a few months. I found the podcast interview with Ed Werder to be a bit tone-deaf. He is still getting paid, he just doesn’t have to work. That’s not what most of us experience when we lose our jobs, even during a layoff. He doesn’t have to worry about benefits or salary for quite some time, and it’s a problem most people would love to have. I understand your sadness for the reporters who lost their jobs at ESPN, but in capitalism economics rule. I worked 34 years in the oil industry and averaged a reorganization every four years during my career. All of the displaced folks eventually landed on their feet because this is America and when one door closes another opens. Wow, 100 people lost their jobs and you are in disbelief, while my former company's latest reorganization resulted in over 10,000 people losing their jobs. Life is good. “Quality of work would not be a consideration?” Then what on earth was the criteria that ESPN used to fire people like Ed Werder? Was it salary? Was there any consideration to asking people to take pay cuts to save jobs? Lots of comments about the Werder situation. I should say I like and respect Werder a lot. Just as all politics are local, all feelings about employment are local in a case like this. Matt’s right when he says Werder’s situation has some major advantages over many laid-off employees: ESPN is committing to pay him his full salary over the next two years. Kenneth: You’re right too—it’s life, and the economic system rules all employment decisions. The reason I wrote about Werder and the impact of an industry laying off quality people like him and Don Banks and Greg Bedard and so many others in the past few years is because it’s leading to a sea-change in a business that’s become increasingly visible. To many, it’s important. I hope you’re right, Kenneth, and the media business shakes out to give very good people full employment. I truly hope that. In 1977, I was 12 years old, and my mom and I were on a plane to Hawaii. I recognized Nick Buoniconti occupying a seat in the same part of the cabin. I was hoping for an autograph, or maybe just to say hello to a larger-than-life star. I think I stammered out something about how great I thought he was, how I loved the Dolphins even though I was a Cowboys fan. I was blathering on so much it may not have even been English. He looked at me, smiling, and said: "Well, you got a few minutes? Sit down." For the next 45 minutes, he answered every silly question I posed (Who was the toughest lineman you ever faced? Who was the best QB you ever saw? ), and regaled me with stories. Finally my mom came back, apologizing profusely for the intrusion. Buoniconti just smiled and said, "Oh, he's fine." He kept talking with me for another 15 or 20 minutes until I caught my mom giving me "that look." I reluctantly returned to my seat. I'm 51, now, and it still makes me smile. Never got the chance to thank him for that. But if character is how a man acts when the cameras aren't rolling, Nick Buoniconti has character to spare. Can you elaborate on your statement that McGinn and the Milwaukee Journal Sentinel “have parted ways,” and “Bob still wants to work?’ The way the Milwaukee Journal Sentinel characterized his departure was as a retirement. This long-time subscriber feels the MJS is running on fumes, and I simply can’t believe they’d screw up having an indisputable asset like McGinn on board. McGinn is much more liked and respected than he will admit, and the MJS knows it. 1. Manny Machado. Young A-Rod but with a clear head and a team-first guy. 3. Carlos Correa. Amazing player and leader and controls a veteran locker room by example. 4. Noah Syndergaard. Best pitcher in the NL not named Kershaw. 1. Kris Bryant. Unbelievable hitter. Solid defense. Humble. Team-first as illustrated by his playing any position on the field. 2. Mike Trout. Because he's Mike Trout. If he could play infield he'd be No. 1. 3. Buster Posey. Stud. Heart of the team. Warrior. A shame he won't be able to play catcher forever. 4. Anthony Rizzo. Great hitter. Team leader. Spectacular defense. Lefty. Keeps everyone light. Trout, Corey Seager, Bryce Harper, Kershaw. I want to start a team with speed, power, defense and a great starting pitcher. Francisco Lindor, Miguel Cabrera, Harper, Trout. I want those who work and don't take success for granted. Jose Altuve, Correa, Trout, Kershaw. Trout, Kershaw, Seager, Harper. A decade from now Trout will be considered one of the five greatest players ever; Kershaw one of the three greatest left-handers ever; Seager the best shortstop in the game, and Harper the greatest winner of his time.